A potentially fatal condition that affects pets throughout the world has been treated for the first time in New Zealand through an incision no bigger than a needle prick, thanks to the efforts and research of Veterinary Specialists Auckland. The procedure was performed on two patients in a single day; Georgie, a one-year old female Golden Retriever, and Sala, a 10-month old female Rottweiler. Georgie’s family, Mark Hughes and his partner Lisa McDonald, are “incredibly relieved” to hear of Georgie’s successful treatment. “Alastair’s been fantastic, he’s been updating us each day. We were surprised how good she looked even a few hours after the surgery,” Mark says. He says Georgie will be home tomorrow, joining Mark and Lisa’s growing family of Lucy the Yorkshire Terrier and Meg the kitten, and is looking better every day. “Portosystemic shunts – also called PSSs - are abnormal blood vessels that take blood from the intestines and bypass the liver, rather than diffusing through the liver like a sponge as they normally would. This results in a clinical syndrome with various life-threatening medical and behavioural consequences,” Dr. Coomer says. Surgically treating PSSs that are within the liver – also known as intrahepatic shunts – is complicated procedure, difficult to perform and often resulting in complications that can lead to loss of life. However, the surgery Dr. Coomer performed on December 1st of this year has changed that. “Percutaneous Transvenous Coil Embolization – PTCE - is an established technique around the world for blocking the shunting vessel from the inside out,” Dr. Coomer says. “A catheter is placed in the jugular vein in the patient’s neck, through which the vascular stent and coils are delivered to block the abnormal vessel. This technique has comparable efficacy to traditional surgery, but is associated with dramatically lower complication and higher survival rates. Dr. Coomer says that after successful treatment and closure of the shunt, the animals in question are expected to live normal lives. “We assembled the dream team for this procedure from around the world, including a mate of mine, a surgeon and interventionist from California who’s really as good as it gets,” Dr. Coomer says. He says the other, more drastic forms of surgery used for intrahepatic portosystemic shunts are riskier, however extensive research and refinement of the procedure made him confident the surgery would be a success. Dr. Coomer says the smoothness of the procedure was both gratifying and relieving. “When you’re establishing a system for the first time you don’t know what snags you might run into. From an operational and logistical perspective, everything went smoothly, and the procedure itself worked flawlessly - which is the most exciting part about it,” Dr. Coomer says. He described the initial reaction of the families to news of the surgery’s success as one of relief, gratitude, and happiness, with both families excited to have their pets home and looking forward to their new lives. The continued use of this procedure is something Dr. Coomer is highly confident about. Dr. Coomer is a long-time animal lover who lives in Auckland with his wife, three children, Harry, their Border Terrier, and two Burmese cats, Arthur and Teddy. An accomplished veterinarian, Dr. Coomer has won multiple awards, both national and international, for his research presentations and veterinary work. After graduating from Massey University with a Bachelor of Veterinary Science, he completed post-graduate specialist training in Canada and Florida and has worked as a specialist in San Francisco and New Zealand, specialising in general surgery. 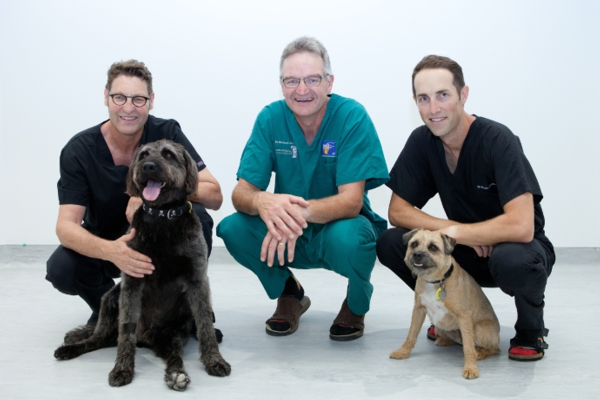 He says that seeking out more effective options for treatment is part of Veterinary Specialists Auckland’s dedication to providing the highest quality care to the animals they treat.